Reviews & News of whatever is trendy! Plenty about iPhone, iPad, Android, Blackberry, Tablets and Apps. There have been plenty of tip applications developed for the Android, Blackberry and iPhone/iTouch. About half of these apps are free and most of the rest are just a couple of bucks. I read the introductions to most I could find and downloaded over a dozen of those that I liked best. 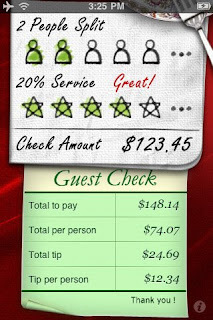 All the apps has some similarities, such as figuring out what tip to leave, and then the main differences were either appearance or the ability to provide advanced tipping options, such as splitting between any number of guests and excluding the tax from the tip calculation. After much playing with the different tip applications on my iPhone I did find two that I preferred most, and they are both free! (with options for a better paid version of course). iHandy Tip Calculator, by iHandySoft Inc, is very easy to use. It has a nice simple display where you tap from 1 to 5 people to divide the bill. If you have more than five people paying there is a scroll wheel that goes up to 30. Next you can click between 1 to 5 stars for levels of service which is a simple way to tip from 5% up to 25%. For those that really want to tip a specific amount, such as 18%, there is a another scroll wheel that goes from 0% to 50% tip. 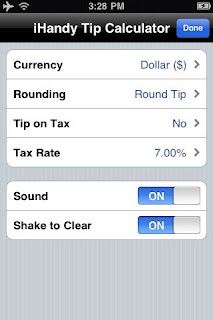 This iPhone app also has options to select a different currency, rounding, tip on tax and sound. There is also a shake option which clears the previous entry. I like the app because it is easy to read, easy to use, and even if you've had a couple glasses of wine, you can still work out the tip and split it any way you need to. 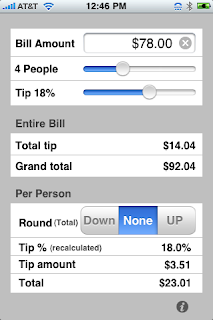 Tip Calculator Pro, by Value Prime, is another easy to use tip application but uses sliders to adjust bill splitting and tip %. I like this display as it shows just the number information required. I really don't need to see a picture of a dinner or dessert while figuring out the bill after I've just finished eating. Both of these neatly displayed iPhone apps do what you want you want them to do - work out what tip to leave. And they do it for free. That's the best tip yet! Did you watch Will & Kate's wedding? Which iPhone features (of the lucky 13) do you use regularly? What iPhones have you bought? What's the most you've paid for an App? Will you be getting Apple TV? Please email kickbuttapplications@gmail.com with any questions, comments or suggestions for application reviews.